Yamaha has recently upgraded its very successful L-Series of steel-string guitars. The most important update, at least in terms of sound quality, is the use of A.R.E.-treated spruce tops across the whole range of models. Yamaha’s proprietary Acoustic Resonance Enhancement is a wood treatment that uses heat, changes in humidity and pressure, to artificially age tonewoods. The aim is to produce brand-new acoustic instruments, which sound played-in from the get-go. L-Series guitars come in three body sizes – LJ (Medium Jumbo), LS (Small Body = Folk-sized) and LL (Original Jumbo = Dreadnought-sized). 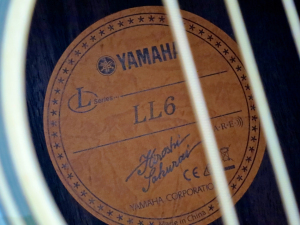 Kitarablogi had the pleasure to take a Yamaha LL6 ARE (current price in Finland:534,90 €) for a spin. Yamaha’s Original Jumbo body style is the company’s own design, set apart from a traditional Dreadnought by its slimmer shoulders and its more rounded lower bout. The result looks nicely balanced. Posted on March 19, 2015, in Uncategorized. Bookmark the permalink. Leave a comment.